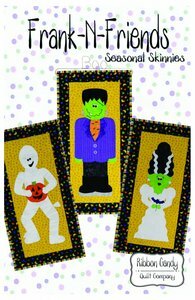 Enjoy your Halloween as you make all three of these adorable Skinnies. Each quilt finishes at 14" x 28". Templates are full size and all three images come in the pattern. Fusible web applique is used.